For our first wedding anniversary, me and Stu took a trip to Perranporth in Cornwall with some of our best friends. I realised while we were there that we were incredibly close to BloodyMary Metal's base. And if you know us at all, you'll know we are both big fans of BMM, so we had to go and at least have a look! Of course, in true Kitty and Stu style... neither of us could resist shinies once we actually saw them in the flesh. We had some money saved up, and our families very finally gave us some money for our wedding anniversary, so it seemed it was meant to be that we would have some BMM to remember the day by. 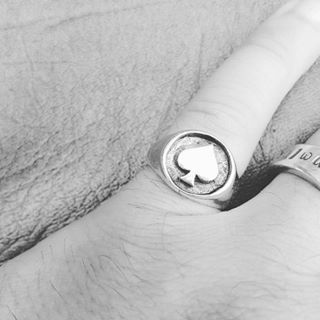 In a case of things that were really meant to be, there was one Lemmy ring left in stock, so it had to be Stu's. Both of us wear a lot of rings all day every day, and all Stu had space for was a pinky ring. And this ring was the perfect size for his pinky! I fell totally head over in heels with this absolute piece of art. Just look at it! So intricate and pretty, and just the right amount of goth. Obsessed. I had a pointer finger free on my left hand and BMM kindly resized it for me to fit. I also left my mini crescent moon stacker right with them that needed resizing. Stu had bought it for me for my wedding ring finger several years ago, but now we're married that finger is otherwise occupied, so it needed to be a bit bigger to join the stack of BMM rings on my right pointer finger. We popped back in a couple of days to pick them up and they've even hammered out the damage I'd done to the moon ring accidentally catching it, without even mentioning it. What absolute sweethearts! I'm such a fan of BMM anyway, and their headquarters are lovely and friendly too. Hopefully we'll get to pop back again some day. Well I obviously live a very secluded life. I've not heard of BloodyMary Metal and I live in Cornwall. oh they are fab and very proud to be from Cornwall!